For other places with the same name, see San Jose (disambiguation). 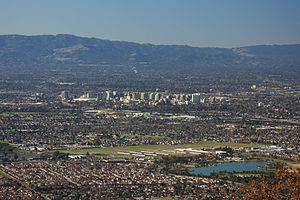 Often called "the Capital of Silicon Valley", San Jose is the largest city in the Bay Area, 3rd largest in California, and the 10th largest city in the United States. It was named the 6th safest big city in the US in 2015. This clean, sprawling metropolis has sports, beautiful vistas, ethnic enclaves, and bleeds into the greater Bay Area for travelers who want to take their time in Northern California. El Pueblo de San Jose de Guadalupe (literally, The Town of Saint Joseph of Guadalupe) was founded by José Joaquín Moraga in 1777 near the present day intersection of Guadalupe Parkway and West Taylor Street. In 1797, the pueblo was moved to the Plaza Pueblo (now Plaza de César Chávez), around which San Jose grew. And the rest is, as they say, history. True to its location in the heart of Silicon Valley, San Jose is now home to the headquarters of many "tech" companies such as Cisco Systems, eBay, and Adobe Systems. There are so many different neighborhoods in the large geographic area of San Jose that, depending on where you are, you might not know if you're still in the same city. Like most Bay Area towns and cities, San Jose is an expensive place to live (many basic houses easily top $1M in price). Some of the hip areas to live these days are in San Jose's downtown area, for those who prefer urban living, or Santana Row for a mixed living, shopping and dining community. You can find vintage California charm in the neighborhoods of Willow Glen and Rose Garden. The woodsy area of Almaden Valley is known for its excellent schools, and Silver Creek is known for its subdivisions of sprawling "McMansions." Evergreen is in East San Jose, right at the foothills of the city. Evergreen has some more affordable housing and is very residential. Since it is at the foothills, east San Jose is not as accessible as the other neighborhoods. Evergreen has excellent views of the foothills and many parks and recreational areas. Groseprick Park is located right in the heart of Evergreen and offers a mile long loop, basketball courts, baseball fields, playgrounds, and hiking trails. People who ask, "Do you know the way to San Jose?" (in reference to the 1968 hit song recorded by Dionne Warwick) will be glared at. There used to be two separate terminal buildings. It has since been re-built into a single long building spanning north and south with the international arrivals building built in between the two original terminals and is accessible from both terminals. The international arrivals building houses departure gates 15 and 16 (for foreign airlines), U.S. Customs and Border Protection inspection facilities and a public arrivals zone for non-travelers to meet & greet international arrivals. International arrivals disembark through Gates 15-18 where passengers proceed downstairs for U.S. immigration and customs inspection. Passengers come out into the public areas (non-secured areas) to meet local contacts or proceed to the adjacent Terminal A or B to check in for the next flight. Passengers will have to go through security screening to access connecting flights. Taxicab A cab to downtown San Jose will cost you approximately $15-$20 and take 10 minutes. Other neighborhoods will cost up to $50 and take up to 15 minutes. Public Transportation Take VTA #10 bus to the Santa Clara Caltrain station. Then take either VTA bus 22 (local) or 522 (express) to Downtown San Jose or take the southbound Caltrain to Diridon Station. From Diridon station you transfer to a multitude of VTA and other buses to your final destination. Likewise you can also take the #10 bus going the other way to the "Metro/Airport" light rail station and take a southbound train (Rt#901 going to Santa Teresa or Rt#902 going to Winchester) to the "Convention Center" station in downtown San Jose. Transfer to or continue on the #902 train (to Winchester) to get to the Diridon Station. The Highway 17 Express continues from Diridon Station to Santa Cruz. Likewise the Santa Cruz Airport Flyer offers a direct ride from the airport to Santa Cruz. Taxicab A cab to downtown San Jose will cost you up to $150 and take 1 hour on average and up to 2 hours in rush hour traffic. Public Transportation Take BART down to to Millbrae. At Millbrae take the Caltrain south to the "Diridon" station. From the Diridon Station there are multiple bus routes or the northbound light rail going up towards Mountain View (Rt #902) to get to downtown. To get to the SJC Airport get off at the Santa Clara CalTrain station and transfer to VTA Rt #10 bus to the airport terminals. A more direct way would be to use the Monterey Airbus which goes from SFO to SJC and then on to Monterey, Marina and Prundale, surrounding Monterey Bay south of San Jose. Their northbound buses, coming from around Monterey Bay, do provide a direct shuttle from SJC to SFO. Taxicab A cab to downtown San Jose will cost you up to $120 and take 40 minutes on average and up to 1h15 in rush hour traffic. Public Transportation Take the BART (shuttle) train to the "Coliseum/Oakland Airport" BART station. Transfer to the southbound Orange or Green Line train to Fremont (end of the line). From the "Fremont" BART station, take VTA express bus #181 to downtown San Jose and Diridon Station. Outbound buses going from Diridon Station to Fremont pick up along San Fernando and 1st Ave. If going to SJC Airport get off at the "Civic" light rail station on N 1st & Mission. From there take a northbound train (Rt#901 going to Alum Rock or Rt#902 going to Mountain View) to the "Metro/Airport" station where you transfer to the #10 bus to the airport. The Capitol Corridor runs 16 times daily (11 on weekends and holidays) between Sacramento, Emeryville and Oakland Jack London Station with some trains continuing to San Jose through Hayward and Santa Clara in the east and south side of the Bay. Caltrain (see below) is the best bet to get between San Jose and San Francisco. Discount BART tickets can be purchased in the cafe car. The Coast Starlight runs once daily between Seattle, Portland, Sacramento, Emeryville (connections to San Francisco by Amtrak Thruway Motorcoach), Oakland, San Jose, San Luis Obispo, Santa Barbara, Oxnard and Los Angeles. The train runs along the same route as the Capitol Corridor (see above) between San Jose and Sacramento but only with fewer stops. Amtrak Thruway Motorcoach operates a bus to San Luis Obispo and Santa Barbara from San Jose and another bus from San Jose to Oakland. A ticket/connection with an actual train is required to board Amtrak Thruway buses. The Amtrak route to Santa Cruz is operated by Santa Cruz Metro Rt #17 (Amtrak Thruway Rt #35) and to Monterey is operated by Monterey-Salinas Transit (MST Rt #55)(See below under 'By bus') which are available without connections to/from Amtrak trains. Caltrain, +1 510 817-1717 operates a regional rail service from San Jose to its San Francisco terminal at Fourth and King in SoMa. The service also runs between San Jose and Gilroy during rush hour. Caltrain is very useful for travel between San Francisco and communities on the Peninsula, Silicon Valley or South Bay. On weekdays Caltrain provides two trains per hour for most of the day but run more during commute hours, including "Baby Bullet" limited services that cruise between San Francisco and San Jose in 57 minutes; on weekends and public holidays trains run hourly, except that after 10PM only one train runs, leaving at midnight. The Diridon Station is the nearest station to downtown San Jose which is a shared facility with VTA (local bus and light rail), Greyhound and other intercity bus lines (see below under 'By bus'). Fares vary depending on how far you go. Tickets must be purchased before boarding the train from ticket vending machines at any of the stations or from ticket clerks at staffed stations. Tickets are checked on the trains and anyone found without a ticket is liable to a substantial fine. Cyclists should use the designated car at the northern end of the train, and be aware that bike space is often limited during commute hours. Altamont Commuter Express (ACE) runs from Stockton, Livermore, and Pleasanton into San Jose and the Santa Clara Valley in the morning and then returns in the late afternoon and evening. Passengers can also transfer to the San Joaquins Train from Stockton as well. Check the schedules beforehand, as there are only a handful of trains per day. There are free connecting shuttles at certain ACE stations, timed to match trains coming from/going to the north. From Santa Clara station, there is a shuttle to/from the San Jose airport. From San Jose Diridon station, there is a shuttle into downtown San Jose. Most of the intercity bus lines connect San Jose to the Los Angeles Metro area and to the San Joaquin Valley (Stockton, Fresno, Bakersfield, etc) with some buses continuing south to San Ysidro and Tijuana. With the exception of Greyhound, Flixbus, Amtrak & CalTrain the other bus lines do NOT sell tickets for travel between San Jose and San Francisco and/or Oakland in the north or anywhere in between in the Bay Area. All northbound buses continuing to San Francisco and Oakland only drop off while the southbound buses only pick up in the SF Bay area. Hoang Express, bus stop at Lees Sandwich Shop, 2525 S King Rd (Small strip mall at S King Rd & Burdette), ☎ +1 408 729-7885, toll-free: +1-888-834-9336. Travels between SoCal (San Diego, El Monte, Los Angeles, Westminster) and northern California (San Francisco, San Jose, Oakland and Sacramento). $60-65 to Bay Area from Los Angeles. International Bus Lines (formerly Intercalifornias), 7121 Monterrey St, Gilroy 95020 (Mexican style strip mall at S King & Story Rd), ☎ +1 213 629-4885, toll-free: +1-888-834-9336. Connects Tijuana, San Ysidro (just over the border), Santa Ana, Los Angeles, San Fernando, Bakersfield, Fresno, and San Jose/Stockton (route splits/joins in Madero) and several other places in between. Prices vary depending on your destination. Tufesa, bus stop at Joyeria Store Vanessa, 1642 Story Rd (Mexican style strip mall at S King & Story Rd), ☎ +1 702 254-6899. Connects San Jose to southern California and Tijuana. Prices vary depending on your destination. Jass, ☎ +1 408 209-0304. Operates a regular shuttle from the SJC airport to Santa Cruz, Monterey, Marina and Prundale around Monterey Bay to the south. Prices depend on travelers choice of destination. San Jose is connected to San Francisco by two major freeways, US-101 and Interstate 280. From Los Angeles, take Interstate 5 North to CA-152 West to US-101 North. From the East Bay, use either I-880 or I-680 South. Travel time from San Francisco and Oakland is about an hour, but the trip is much longer during rush hour on US-101 and Interstate 880. Taking Interstate 280 from San Francisco is a scenic alternative, and consider a detour westward on Highway 92 to Half Moon Bay and the coastal Highway 1, which leads north to San Francisco and south to Santa Cruz. From Santa Cruz, take Highway 17 through the mountains. The downtown area is compact and rather easy to get around on foot. Most of the streets are arranged in a grid, but the grid is not strictly aligned with north (more like north–northwest). Street address numbers increase (by 100 every 2 or 3 blocks) radiating from Santa Clara Street (an east/west street) or First Street (a north/south street). Furthermore, Santa Clara Street (and other east/west streets) carry the prefix East or West radiating from First Street; and First Street (and other north/south streets) carry the prefix North or South radiating from Santa Clara Street. This makes it somewhat easy to locate a downtown facility given its street address. Downtown Willow Glen, Campbell and Japantown are also easy to navigate on foot. Going from one neighborhood to the other on foot is not easily feasible except for some neighborhoods directly adjacent to Downtown (such as Japantown and the Alameda area). Outside downtown, things are spread out in San Jose, so a car is the most convenient mode of transportation. Interstate 280 is the fastest route East–West, for example from the Valley Fair Mall or Santana Row, to the West, to Downtown, or from Downtown to Alum Rock Park. California 87 (to and from the airport) and Interstate 280/California 17 (from Rose Garden to Campbell and vice versa) offers fast North-South travel. The Santa Clara Valley Transit Authority (VTA), does offer serviceable transit around town. The frequency and hours of buses vary depending on the route and your location, so it's best to check a schedule beforehand. The Light Rail system (primarily the Mountain View-Winchester route and the Alum Rock-Santa Teresa route) also provides quick service to, from and around downtown and Diridon Station; a single fare, $2, is good for 2 hours. It's a trolley, it's a train... it's Light Rail! A VTA day pass lets you use buses and Light Rail lines all day and costs $6 for an adult, and $5 for a youth as of 2014. VTA Route #10 serves as a free shuttle between the SJC airport, Santa Clara CalTrain Station and the Metro/Airport Light Rail Station. DASH (Downtown Area SHuttle Rt#201) is another free service connecting downtown San Jose to the San Jose Diridon Transit Center. The 511.org website is a wonderful resource for trip planning, whether by car or public transit (or a combination of both). Its Trip Planner spans all Bay Area transit systems. On the go, you can call VTA Customer Service at +1 408 321-2300 and listen to bus schedules on their automated system or download an app on your iPhone or Android Phone. Many roads in San Jose have designated bike lanes and/or wide shoulders. A map of the city's bikeways is available on VTA's website. This, along with typically favorable local weather, makes biking a viable means of transportation within the city. Bus lines, light rail and Caltrain all accommodate bikes, making mixed-mode travel a simple affair. There are a limited but growing number of Bay Area Bike Share stations around Downtown and Japantown (but, as of 2018, not in other neighborhoods) which allow anyone to rent city bikes for 30 minutes at a time (time above that costs extra). As of 2018, a 24-hour pass offers an unlimited number of 30-minute-long rides and costs $10. A 3-day pass costs $20, so if you will be staying longer than three weeks in a year, then the $149 annual pass might make financial sense. Downtown San Jose is a mix of offices, shopping, hotels, numerous restaurants as well as a convention center and the SoFA (South of First Area) nightclub district. Check out the San Pedro Square Farmer's Market on Fridays for local and organic produce, or visit the new City Hall (2005) and the nearby San Jose State University campus. The new main library (2003) is a prestigious, award-winning, joint-use library combining resources of the city and San Jose State University. Get outdoors and take advantage of San Jose's invariably sunny weather on the Guadalupe River Trail or in one of the many city parks. You'll always find a wealth of cultural events at theaters, art galleries, and museums. 37.3316-121.891 The Tech Museum of Innovation (Museum of Science and Technology), 201 S Market St (near Park Ave), ☎ +1 408 294-TECH (8324). A great interactive experience for all ages and backgrounds. The Tech Museum allows visitors to see how technology affects their daily lives. Permanent exhibits focus on the Internet, the human body, and exploration. You'll also find an IMAX Theater, a cafe, and a retail store featuring merchandise unique to the Silicon Valley. $16 (museum and IMAX). 37.3335-121.892 San Jose Museum of Art, 110 S Market St (at W San Fernando St), ☎ +1 408 271-6840. Tu-Su 11AM-5PM. Recognized for its contemporary collection of modern art, which highlights movements on the West Coast as well as national and international pieces. The museum started as a small civic art gallery in 1969 and has grown in step with its city. $8 general admission, $5 seniors/students. 37.3378-121.8863 San Jose City Hall, 200 E Santa Clara St (near S 4th St), ☎ +1 408 535-3500. Designed by architects Richard Meier & Partners, the new City Hall, opened in 2005, consists of a free standing glass rotunda at the center, a council chambers wing to the south, and a separate tower to the east. Tours are available. This self-cleaning automatic toilet, at the corner of S Market & W Santa Clara Streets, is free and a welcome convenience for pedestrians. 37.3281-121.8845 San Jose Museum of Quilts and Textiles, 520 S 1st St (near E William St), ☎ +1 408 971-0323. Tu-Su 10AM-5PM. The first museum in the US to focus on quilts and textiles, the San Jose Museum of Quilts and Textiles has an outstanding collection on a rotating display. Exhibitions change quarterly at this exciting and modern museum. $6 general admission, $5 seniors/students with ID (free for everyone on the first Friday of the month). 37.3332-121.8886 Paseo de San Antonio. A four-block pedestrian-only space, running between SJSU and Plaza de Cesar Chavez, lined with shops, hotels, casual and fast-food restaurants, and the Camera 12 Cinemas, At the Market Street end, an oversized bronze table features memories and writings of Mexican immigrant, activist, and SJSU professor Ernesto Galarza. 37.319444-121.9508338 Winchester Mystery House, 525 S Winchester Blvd, ☎ +1 408 247-2101. Tours daily 9AM-7PM. Check their website for a current schedule.. The legend is that Sarah Winchester, Winchester Rifle heiress, was afraid of being cursed by the ghosts of those who had been killed by Winchester guns. She thought that as long as construction continued, the ghosts would be kept at bay. Construction did continue (for 38 years! ), resulting in a fantastic house full of mazes, stairs that go nowhere and other odd architecture. Beware: visitors have reported seeing paranormal objects in the house. Mansion Tour: $26, Behind-The-Scenes Tour: $23, Grand Estate Tour (combined) $31 (discounted rates for seniors and children). 37.3203-121.9489 Santana Row, 368 Santana Row (near S Winchester Rd), ☎ +1 408 551-4611. A "European-style" village of shops, restaurants, and high-priced condos, with hotels and great nightlife. There's a year-round farmer's market on Sundays, and during the summer bands play free outdoor music every weekend. Santana row has become a hang-out spot for San Jose's residents. Has numerous restaurants, bakeries, cafes and central garden. Stores include Anthropologie, J. Crew, and surf shops. Its development has had a huge impact on the San Jose landscape and economy. 37.3342-121.923310 Rosicrucian Egyptian Museum and Planetarium, 1664 Park Ave, ☎ +1 408 947-3636, e-mail: info@egyptianmuseum.org. M-F 9AM-5PM, Sa-Su 11AM-6PM. This museum of Ancient Egypt features exhibits funded by the Rosicrucian Order, who have secured artifacts from archaeologists working in the area since the 1920s. Take a tour through a detailed replica of an Egyptian tomb and browse their collection of mummies and artifacts. $9 general admission, $7 seniors/students, $5 children 5-10, free for children under 5. Japantown, Between Jackson and Taylor on 1st-5th Sts (VTA Light Rail Station Japantown/Ayer). The neighborhood surrounding Fifth and Jackson streets (a mile from Downtown) has some good restaurants, retail shops, and cultural facilities. Festivals are held several times a year, and there is a year-round farmer's market on Sundays. Willow Glen, Lincoln Ave between Willow St and Minnesota St. This charming shopping district was once the center of a town separate from San Jose. Has a variety of small shops and restaurants, as well as a farmer's market and a handful of community festivals and events throughout the year. 37.3322-121.92811 San Jose Municipal Rose Garden, Naglee Ave between Dana Ave and Garden Dr, ☎ +1 408 277-2757. 8AM to half hour past sunset. San Jose's 5 1/2–acre Municipal Rose Garden, once a prune orchard, draws thousands of visitors each year. The Garden is exclusively devoted to shrubs of the rose family and features over 4,000 rose shrubs with 189 varieties represented. Hybrid–teas comprise 75 percent of the plantings. free. 37.343887-121.90745712 Heritage Rose Garden, Spring St and Taylor St. half an hour before dawn to half an hour after dusk. This garden, initially planted by volunteers in 1995, has a collection of almost 4,000 plants of more than 3,000 rose varieties. free. 37.3977-121.813 Alum Rock Park, 15350 Penitencia Creek Rd. half an hour before dawn to half an hour after dusk. Amazing park nestled in the Eastern foothills of Silicon Valley. Great for picnics, hiking, biking, and exploring. Great scenic trails, and 1800s era natural spring baths. free. 37.341389-121.64277814 Lick Observatory, Mount Hamilton Rd, ☎ +1 408 274-5761. Lick Observatory can be found on the highest point of Mount Hamilton. It can be seen on a clear day in San Jose. It has a paved road climbing up to it which was originally a horse track, which it is a steady incline. There are three telescopes on the mountain, including a newer one within walking distance of the observatory. There are tours of one of the telescopes and a gift shop. Sometimes gets snow in winter and on a cloudy day it is above the clouds. 37.322222-121.86111115 Japanese Friendship Garden, 1300 Senter Rd, ☎ +1 408 794-7275. Six-acre open, park-style garden designed to resemble the famous Korakuen in Okayama, Japan. 37.3475-121.89316 Japanese American Museum of San Jose, 535 N 5th St, ☎ +1 408 294-3138. Th-Su noon-4PM. Documents the history of Japanese Americans in the San Jose area. Highlights are a collection of farm equipment used on Japanese-American-owned farms and a recreation of a barracks from the internment during World War II. $5. 37.3501-121.86417 Five Wounds Portuguese National Church, 1375 E Santa Clara Street (VTA bus routes 22, 522), ☎ +1 408 292-2123. Located at the edge of the Little Portugal neighborhood and built in 1916–19 with materials from the Portuguese pavilion of the 1915 Panama-Pacific Exposition, this parish church of the Roman Catholic Latin Rite, with its Neo-Manueline archictecture, is one of the most photographed and painted buildings in San Jose. San Jose has two major professional sports teams, some fantastic amusement parks and a variety of theater and comedy venues to entertain you throughout the year. The city also hosts a colorful array of festivals and conventions and offers plenty of shopping options. You're on their ice when the San Jose sharkhead is lowered from the ceiling of the arena, affectionately known as "The Shark Tank." San Jose Sharks. The SAP Center, formerly known as HP Pavilion (aka "The Shark Tank"), hosts this National Hockey League team, which has enjoyed relatively good success since their inception in 1991. Watch one of the more famous traditions as the team enters the rink out of a 17-foot high shark head. San Jose Earthquakes, Avaya Stadium, 1123 Coleman Ave, ☎ +1 408 556-7700. The Bay Area's Major League Soccer team. The "Quakes" opened their new Avaya Stadium for the 2015 season. San Jose Giants. San Jose's single-A minor-league baseball team (affiliated with the San Francisco Giants) plays in the California League from April to September. Games are held at historic San Jose Municipal Stadium. The BBQ area next to left field is a hit with fans before the game. San Jose State Spartans, ☎ +1 408 924-SJTX (7589). M-F 9AM-5PM. The Spartans represent San Jose State University in NCAA Division I sports. Most of the school's six men's and 13 women's teams compete in the Mountain West Conference. Cinnabar Hills Golf Course, ☎ +1 408-323-5200. 27-hole course ranked among the top ten in Northern California. 37.3959-121.9722 California's Great America, 4701 Great America Pkwy, Santa Clara, ☎ +1 408 988-1776. Mostly 10AM–10PM from June to August; weekend hours vary seasonally. With roller coasters, thrill rides, children's attractions, the Boomerang Bay water park, and Vegas-style live shows. Parking costs $20. $40+. 37.3257-121.8625 Happy Hollow Park and Zoo, 748 Story Road, ☎ +1 408 794-6400. 10AM–4PM most of the year, and 10AM–5PM on weekends and during the summer. A small, child-friendly amusement park with some animal exhibits. The carousel, train, miniature roller coaster and other rides are all included in the admission price, but bring a few quarters if you want to feed the goats in the petting zoo. Try VTA buses #73 and #25 to save $10 per vehicle on parking. $14.25 per person. Improv Comedy Club, 62 S 2nd St, ☎ +1 408 280-7475. A downtown venue showcasing well-known comedy acts, they have a full restaurant and bar. The club is also great for group outings for 10-400 people. ComedySportz San Jose, 288 S 2nd St (at the Camera 3 Cinemas), ☎ +1 408 985-LAFF (5233). F 9PM, 11PM; Sa 7PM, 9PM. Named "Best Local Theatre" by the Metro's "Best of the Silicon Valley", ComedySportz is an interactive improv comedy show where two teams of "act-letes" compete in various comedic games, with the audience as the judge. $10-15. Opera San Jose, 2149 Paragon Dr (California Theatre), ☎ +1 408 437-4450. Sep-May. San Jose's resident opera company performs on a restored 1920s vaudeville stage and features some of the most accomplished young voices in the country. $50-100. Children's Musical Theater San Jose, 271 S Market St (Montgomery Theater), ☎ +1 408 288-5437. This children's theater puts on productions the whole family can enjoy, from 'Peter Pan' to The Who's 'Tommy'. $15–25. Teatro Visión, 1700 Alum Rock Ave, Suite 265, ☎ +1 408 272-9926. Known for putting on high-quality Chicano/Latino plays in San Jose for over 25 years, Teatro Visión celebrates community, culture, and the vision of a better world. Ballet San Jose, 255 Almaden Blvd (Center for the Performing Arts), ☎ +1 408 288-2800. Oct-May. Formerly the San Jose Cleveland Ballet and more recently Ballet San Jose Silicon Valley, this highly skilled and innovative company includes dancers from all over the world. Each season, they perform an extensive repertoire of classical and contemporary works. $25-85. Cinequest, ☎ +1 408 295-QUEST (78378). One week every March. A film festival emphasizing digital production, with screenings and guest speakers at venues throughout San Jose. Named one of the Top 10 Film Festivals in the world by the Ultimate Film Festival Survival Guide. San Jose Jazz Festival (San Jose Jazz Summerfest), ☎ +1 408 288-7557, e-mail: info@sanjosejazz.org. every August. A weekend of jazz as well as blues, salsa, and big bands, playing on a dozen mostly outdoor stages. San Jose Metro Fountain Blues Festival (San Carlos Plaza at San Jose State University). Every May. This day-long concert will celebrate its 30th anniversary in 2010. Around 8,000 blues enthusiasts show up yearly for an impressive lineup of blues musicians. It all happens in the open air on the university campus downtown. $5. Starlight Cinemas, San Pedro Square/ Historic District/ SoFA District. Most Wednesdays, June–August, dusk. Outdoor movie screenings all summer long, held in a different neighborhood each week. Bring some lawn chairs and a picnic, or check out the nearby cafes and eateries. Films range from true Hollywood classics to newer hits. Once a month, Post Street Summertime Blues joins Starlight Cinemas with a live blues performances before the show. free. Downtown Ice, 120 S. Market St (between the Fairmont Hotel and the San Jose Museum of Art). November–January. It doesn't get more California than an outdoor ice skating rink surrounded by a circle of palm trees. The admission price includes rental skates and ice time. $15 general admission, $13 children 12 and under. 5 de Mayo (Cinco de Mayo). First Sunday of May. The Sunday right before or after May 5th is the biggest Cinco de Mayo celebration in the Bay Area. A parade takes place downtown early in the morning, followed by music and cultural events held in Guadalupe Park and the Santa Clara County Fairgrounds in the afternoon. Nikkei Matsuri, Japantown. Held in spring each year around late April/early May. Features Japanese-American arts, crafts and food. Sake San Jose, Japantown. Held in spring each year. Combines sake tasting with a walk through historic Japantown. Christmas in the Park, Plaza de Cesar Chavez. Features Christmas scene dioramas and decorated trees sponsored by local businesses and civic organizations; carnival rides; and fair food. Displays free, carnival priced per ride. Further Confusion. January. One of the world's largest conventions for fans of furry (anthropomorphic animals or creatures) art, writing, comics, and costuming. If you like walking around in a dog costume, this 4-day event is for you. $40. Consonance. March. A mid-sized convention devoted to fans of filk, a subgenre of folk music inspired by science fiction and fantasy themes. $40-50. BayCon. May. A long-running regional science fiction convention. $50. Fanime. May. The largest anime convention in Northern California. $30-35 one day, $60 full weekend..
California Extreme. July or August. An all-you-can-play exhibition of classic pinball machines and arcade games. All games are free for attendees, so you can leave your quarters at home! $30–35 one day, $60 full weekend. SiliCon. October. A small science fiction convention with a media track. Pacificon. October. Amateur-radio convention of the Pacific Division of the American Radio Relay League. $28 at the door, discount for pre-registration, free to youth 17 and under. Valley Fair, 2855 Stevens Creek Blvd, ☎ +1 408 248-4451. One of the largest shopping malls in Northern California, Valley Fair has over 250 stores and several restaurants. Valley fair has gone under tremendous renovations within the last few years making it bigger and more modern. Santana Row, 368 Santana Row (off of Stevens Creek), ☎ +1 408 551-4611. Across from Valley Fair is a "European-style" village of high-end and specialty shops, restaurants, and high-priced condos. There is also a giant chess board where you can battle using pawns that are half your size. Berryessa Flea Market, 1590 Berryessa Rd, toll-free: +1-800-BIG-FLEA (244-3532). A huge outdoor flea market including California's largest farmer's market. Everything from furniture and stereos to haircut salons and massages can be found here, if you look hard enough. Spanish is the lingua franca, but you can get by using English. Moon Zooom, 1630 W San Carlos St, ☎ +1 408 287-5876. Stashed inside a converted home, this is San Jose's one-stop shop for your vintage clothing and costume desires. Explore racks and racks of retro styles from the 50s, 60s, 70s and 80s. Fry's Electronics, 550 E Brokaw Rd, toll-free: +1-877-688-7678. Offering the best selection in town for consumer electronics and gadgetry, this particular Fry's branch is unique for its Mayan-themed architecture and decor. It's one of several Fry's stores in the Bay Area. 37.330415-121.888671 Arcadia – Modern American Steakhouse, 100 W San Carlos St, ☎ +1 408 278-4555. A 130-seat modern American Steak House with a cuisine of classic American Dishes. Wine from California and Europe. The Private Dining Room can accommodate up to 40 people. 37.335498-121.8981762 Henry's Hi-Life, 301 W St John St, ☎ +1 408 295-5414. Lunch: Tu-F 11:30AM-2PM. Dinner: M-Th 5PM-9PM, F-Sa 4PM-9:30PM, Su 4PM-9PM. Special hours during NFL and NHL seasons.. A brick BBQ and steakhouse popular with local guys on their way to or from a Sharks game. Located close to the Shark Tank as well as the Guadalupe River, the restaurant has survived floods of both hockey fans and water. $15-30. 37.303766-121.9788533 Amato's Restaurant, 1162 Saratoga Ave (in Maple Leaf Plaza), ☎ +1 408 246-4007. M-F 11AM-10PM, Sa 11AM-9PM, Su 11AM-7PM. This tiny shop in West San Jose specializes in cheese steaks and hoagies. 35 sandwiches on the menu and sizes from 7 to 24 inches. $6-30. 37.323536-121.9588754 A Slice of New York, 3443 Stevens Creek Blvd, ☎ +1 408 247-5423. Tu-Sa 11AM-midnight. This establishment specializes in New York pizzas/slices, Calzones and Strombolis. $3.25-30. Gordon Biersch Restaurant Brewery, 33 E San Fernando St (downtown, half a block from VTA Santa Clara Light Rail stop, the Camera 12 theaters, San Jose Rep, and various night clubs), ☎ +1 408 294-6785. Su-W 11:30AM-11PM, Th 11:30AM-midnight, F-Sa 11:30AM-2AM. California fusion cuisine and a wide variety of freshly-brewed Gordon Biersch beers. Eat inside or at a courtyard table. Recommended: Garlic Fries: French fries smothered in garlic, and parsley. $12-28. Sonoma Chicken Coop, 31 N Market St (and 2 other San Jose area locations), ☎ +1 408 287-4098. Su-Th 11AM-9PM, F-Sa 11AM-10PM. Rotisserie chicken and California fusion cuisine in a casual atmosphere. As an added bonus, they brew their own beer and have a nicely sized covered patio area. $10-20. Poor House Bistro, 91 S Autumn St, ☎ +1 408 29-BLUES (25837). M-Th 11AM-9PM, F-Sa 11AM-10PM, Su 10AM-8PM (brunch 10AM-2PM). San Jose's "New Orleans Joint". Is close to the Shark Tank and serves a variety of New Orleans-style food including gumbo, red beans & rice, jambalaya and po' boys. Live music on Fridays and Saturdays and a regular Jazz Brunch on Sundays. $10-15. In-N-Out Burger, 550 Newhall Drive (On Coleman, W of I-880), toll-free: +1-800-786-1000. 2 other San Jose locations. $5–10. Bill's Cafe, 1115 Willow St (and 4 other San Jose locations), ☎ +1 408 294-1125. 7AM–PM daily. For a weekend (or weekday) brunch, Bill's can get pretty packed, and for good reason. They offer an overwhelming selection of breakfast crowdpleasers like omelettes, Belgian waffles and a dozen different styles of eggs Benedict. For lunch, they serve homemade soups, meal-size salads, burgers, sandwiches and wraps. There's also a full bar, low-carb menu options and outdoor patio seating. $10–30. The Loft, 90 S 2nd St (downtown, less than 1 block from VTA Santa Clara Street Light Rail stop), ☎ +1 408 291-0677. M–W 11AM–10PM, Th–Sa 11AM–1:30AM, Su 11AM–11PM. Meat, seafood, vegetarian. The salmon pasta with capers in a white sauce and the sun-dried tomato and garlic soup are delicious. They also have a Campbell location, called Capers. $100 gift cards are sold for $70 (rarely $50) at local Costco stores. $12–29. Morton's Steakhouse, 177 Park Ave, ☎ +1 408 947-7000. Naglee Park Garage, 505 E San Carlos St, ☎ +1 408 286-1100. Tu-Sa 5PM-9:30PM, Su 9AM-1PM. A neighborhood eatery featuring contemporary and traditional American dishes. Locals congregate here for patio dining and weekly live music during summer months. Dinner entrees $12-20, sides priced separately..
Scott's Seafood Grill and Bar, 185 Park Ave, ☎ +1 408 971-1700. Lunch: M-F 11:30AM-5PM, Dinner: M-Sa 5PM, Su 4:30PM. A classic selection of seafood, as well as pasta and steaks from the grill and a full bar. Dress is business casual during the day, and a little dressier at night. Is on the 6th floor and has a fantastic view of downtown and Silicon Valley. Reservations recommended. $20-40. Original Joe's, 301 S 1st St, ☎ +1 408 292-7030. 11AM-1AM daily. A San Jose classic, in business for over 50 years. Hearty American and Italian food and 70s diner decor. Always, always busy and one of the few places open late in the downtown core. Be prepared to wait for a table and leave with a full belly. $20-40. Il Fornaio, 302 S Market St, ☎ +1 408 271-3366. M-Th 7AM-10PM, F 7AM-11PM, Sa 8AM-11PM, Su 8AM-10PM. At the Sainte Claire Hotel, near Original Joe's. Regional dishes of chicken, veal, fish, steak, pasta, salad, prepared by chefs imported from different parts of Italy: Bakery with specialty coffees, desserts, and Italian artisan breads. $15-30. Aqui Cal-Mex Grill, 1145 Lincoln Ave, ☎ +1 408 995-0381. M-Th 11AM-9PM, F 11AM- 9:30PM, Sa 10AM- 9:30PM, Su 10AM- 9PM. This place serves Mexican food as if it passed through a fun-house mirror. One of the first places to use gourmet burrito wraps. Inside the wraps you'll find fish and fillings from anywhere on the Pacific Rim: salmon, yellow-fin tuna, or plantains. Satisfying, fresh and creative. $7-10. Taqueria Corona, 601 N 4th St, ☎ +1 408 925-9336. This bright taqueria in Japantown is a traditional, leisurely, sit-down Mexican restaurant. Choose from seafood plates, chimichangas, al pastor and more. Their tortillas are homemade, and there's a nice selection of domestic and Mexican beers. $10–20. La Victoria Taqueria, 140 E San Carlos St (and 2 other locations), ☎ +1 408 298-5335. 7AM-3AM daily. La Victoria stays open late to cater to the local late-night revelers. You can buy a burrito anywhere, but this is the only place to get their famous Orange Sauce, a very spicy creamy concoction featured on a Metro Silicon Valley cover. $5-10. Iguana's Burritozilla, 330 S 3rd St. 10:30AM-11PM daily. You can choose several different burrito styles, 8 types of meat and 3 types of beans. Try the "Burritozilla" if you dare—it's 17 inches long and weighs in at a whopping 5 pounds. $5-10. Dia de Pesca, 55 N Bascom St (A short block north of W San Carlos St and the VTA 23, 61, and 62 bus stop), ☎ +1 408 287-3722. Su–Th 10:30AM–8PM, F–Sa 10:30AM–8:30PM. Mexican-style seafood with a few meat dishes. Casual: you order at the cash register and then sit inside or outside. The Caldo de Mares (Seven Seas Bouillabaisse) is delicious, though you may need a friend to help you eat it. It is served with the kind of tortillas that you can buy at a supermarket. The seafood tacos and burritos are also quite good. $3–21. Mezcal, 25 W San Fernando St, ☎ +1 408 283-9595. Specializes in regional cuisine from Oaxaca. With the second-largest Vietnamese-American community living in San Jose, Vietnamese restaurants have proliferated here in the past few decades. Vietnamese cuisine features fresh herbs, often added to the meal at the table. The signature dish of Vietnamese cuisine is phở, a beef soup with rice noodles, usually with a choice of cuts of meat available. Bánh mì (sandwiches), noodle bowls, and rice plates are also common choices. Lee's Sandwiches, 260 E Santa Clara St and 6 other locations in San Jose. 6AM-9PM daily. San Jose's home-grown chain of Vietnamese Sandwich shops started with a catering truck and now has dozens of locations around the country. Lee's offers Vietnamese baguette sandwiches, European-style sandwiches, smoothies and bakery items at low prices with fast service. Under $10. Thiên Long Restaurant, 3005 Silver Creek Rd #138, ☎ +1 408-223-6188, e-mail: eat@thienlongrestaurant.com. 9AM-10PM daily. This very informal restaurant (a waitress will take your order and bring your food but not your check: you pay at the counter) has few non-Asian customers and puts out a varied menu of very tasty food. You'll notice the good smell as you enter. Many photographs of their food are on their site. Vung Tau, 535 E Santa Clara St, ☎ +1 408 288-9055. M-Th 11AM-3PM, 5PM-9PM, F-Su 10AM-9PM. One of the first Vietnamese restaurants to become popular outside the Vietnamese community, Vung Tau continues to serve a wide range of Vietnamese favorites in a refined atmosphere. Vegetarian menu available. Dinner entrees $15-25. Try some sushi in San Jose's Japantown. 37.349277-121.8940575 Kaita Restaurant, 215 Jackson St, ☎ +1 408 287-5551. M-Sa 11:30AM-2:00PM Lunch & 5:00PM-9:30PM dinner. Cosy, quaint restaurant on Japantown's main strip. Authentic Japanese cuisine. Very good combo meals and whiteboard specials. $11-30. 37.349227-121.8932836 Kazoo Restaurant, 250 Jackson St, ☎ +1 408 288-9611. Lunch: M-F 11:30AM-2PM, Sa-Su noon-2PM; dinner: M-Th,Sa 5PM-9:30PM, F 5PM-10PM, Su 4PM-9PM. This Japantown restaurant has friendly service and a large selection of fresh sushi. Try sitting at their sushi boat bar, which can be a lot of fun and remove some of the mystery of ordering sushi for the uninitiated. The menu ranges from traditional to very Californian. $10-30. 37.348949-121.8948447 Gombei, 193 Jackson St, ☎ +1 408 279-4311. M-Sa 11:30AM-2:30PM and 5PM-9:30PM. An inexpensive homestyle Japanese restaurant in Japantown. The udon and teishoku lunches are very popular, so try to schedule your lunch a little early or late to beat the crowd. $6-14. 37.349746-121.8937898 Minato Japanese Cuisine, 617 N 6th St (north of Jackson St), ☎ +1 408 998-9711. Lunch: Tu-Sa 11:15AM-1:45PM; dinner: Tu-Th 5PM-8:30PM, F-Sa 5PM-9PM. Good inexpensive traditional Japanese food in Japantown; favorite among locals and visitors. Closed Sundays and Mondays. $6-16. In addition to the several Korean restaurants in San Jose, numerous Korean restaurants are concentrated in the "Koreatown" neighborhood on El Camino Real in neighboring Santa Clara. Omogari Korean Restaurant, 154 Jackson St, ☎ +1 408 288-8134. M-Sa 11:30AM-9PM. A busy local favorite. [dead link] Rangoli, 3695 Union Ave, ☎ +1 408 377-2222. Upscale Indian, long on flavor if occasionally a little short on mouth-burning spice. Extensive lunch buffet, excellent wine list, and a quiet, romantic atmosphere. $12-22. Krung Thai. In spite of the building's nondescript exterior, it's some of the most loved Thai food in the area. If you tell them to make it spicy (or even medium spicy), be prepared to eat some VERY spicy food. The newer New Krung Thai Restaurant is managed by the same family, has the same menu, and is less than a mile away. $10–30. New Krung Thai Restaurant, 580 N Winchester Blvd, ☎ +1 408 248-3435. The Original Krung Thai, 640 S Winchester Blvd, ☎ +1 408 260-8224. Hunan Taste, 998 N 4th St, ☎ +1 408 295-1186. M-Sa 11AM-8:30PM. An offshoot of Henry Chung's original Hunan Restaurant on Kearny Street in San Francisco (the one with eight tables and a counter space which was once hailed by New Yorker magazine as "The Best Chinese Restaurant in the World"). A quintessential hole-in-the-wall, but the service could not be nicer, as is the hot, garlicky cuisine, if you're so inclined. Beer and wine are available. $10-20. King Eggroll, 1221 Story Rd, ☎ +1 408 999-0798. 7AM-8PM daily. Often dubbed "The Asian McDonalds", King Eggroll offers a variety of fast-food style Asian dishes, dim sum, sandwiches and combination plates. As the name would imply, though, most come here for their famous egg rolls! $5-10. Taiwan Restaurant, 1306 Lincoln Ave (Willow Glen), ☎ +1 408 289-8800. A neighborhood favorite for many years, the food is not 100% traditional but still flavorful. most entrees $10-20. Good Karma Vegan House, 37 S 1st St (between Post & Santa Clara, downtown), ☎ +1 408 294-2694. M-Sa 11AM-9PM, Su noon-7PM. Even the local carnivores find something to love at this hipster vegan deli. The food is filling and flavorful, and the owners are friendly, mellow guys who donate what little wall space they have to local artists. They have a weekly bingo night, beer on tap and free internet access. They even offer vegan turkeys made-to-order during the holidays. Their menu is revolving, so there's always something new to try. $5-10. Vegetarian House, 520 E Santa Clara St, ☎ +1 408 292-3798, e-mail: info@vegetarianhouse.us. M-F 11AM-2PM, 5PM-9PM, Sa-Su 11AM-9PM. A friendly, funky place with bright decor and cheerful servers. Menu selections take inspiration from around the globe, including western, Chinese, and Indian styles. most mains $10-15. Tofoo Com Chay, 388 E Santa Clara St, ☎ +1 408 286-6335. M-F 9AM-9PM, Sa 10AM-6PM. A tiny lunch counter specializing in Vietnamese vegetarian dishes, including bánh mì, noodle soups, and rice plates. under $10. Falafel's Drive-in, 2301 Steven's Creek Blvd, ☎ +1 408 294-7886. A family-run local favorite, there is always a line at the drive-in. They offer authentic Middle Eastern cuisine including falafel, hummos and gyros as well as hamburgers, fries and homemade milkshakes. $5–10. Zeni, 1320 Saratoga Ave (at Payne), ☎ +1 408 615-8282. Tu-Th 11:30AM-10PM, F 11:30AM-11PM, Sa noon-11PM, Su noon-10PM. An Ethiopian restaurant that knows how to show off the complex flavors of the cuisine. Meals are served Ethiopian style, on injera bread. A full Ethiopian coffee ceremony is available, but they ask that you request it an hour in advance. Many options for vegetarians, as well as a full bar. $10-20. Nightlife in the Downtown area is a mix of lounges, clubs, and bars which, according to locals, have either greatly improved the scene or marked the beginning of its decline. Santana Row has a number of upscale clubs and bars and has been the new hotspot since 2005. Goosetown Lounge, 1172 Lincoln Ave, ☎ +1 408 292-4835. 9PM-2AM daily. Willow Glen's neighborhood bar and cocktail lounge; if you're into a late night pops and enthusiastic renditions of 'YMCA', this karaoke hotspot may be for you. $5-10. The Lobby Lounge, 170 S Market St (in the Fairmont), ☎ +1 408 998-1900. Noon-midnight daily. An upscale piano bar inside the Fairmont Hotel, with an impressive wine list, over 500 different cocktails and martinis, and an array of single malt scotches. They offer weekly wine tastings, live jazz and piano nightly, and free dance lessons on Fridays. $10-20. Think outside the olive! Choose from oodles of creative martinis at the Fairmont's Lobby Lounge. The Vault, 81 W Santa Clara St, ☎ +1 408 298-1112. Th-Sa 9PM-2AM. This hot spot for dancing and drinking is inside a renovated 1920s bank building, mixing historical architecture with a very contemporary club scene. Bottle service, pounding music, and usually a $20 cover on weekends. $10-30. San Jose Bar & Grill, 85 S 2nd St, ☎ +1 408 286-2397. M-F 4PM-2AM, Sa 1PM-2AM, Su 5PM-2AM. Since one Happy Hour just isn't enough, the Grill offers all kinds of specials on wings, burgers and drinks throughout the week. It's a good place to watch sports, especially Sundays during football season. Weekly karaoke and DJs on weekend nights. $5-10. [dead link] JJ's Blues, 3439 Stevens Creek Blvd, ☎ +1 408 243-6641. M-Sa 5:30PM-2AM, Su 4PM-2AM. One of the most popular places in the Bay Area to hear live blues music, and one of the few San Jose clubs with live music every night of the week. JJ's has been around for two decades and hosts jam nights, unsigned acts and big names. There's a vintage Steinway that's up for grabs during intermissions, so you too can get the blues. $5-10. Splash, 65 Post St, ☎ +1 408 993-0861. Th-Sa 9PM-2AM. San Jose's downtown gay video bar, nightclub and lounge is friendly to people of all persuasions. $5-10. Tanq, 301 S Market St, ☎ +1 408 280-1300. 11:30AM-midnight daily. Downtown San Jose's newest hip bar with a great aquatic theme,located on the corner of Market and San Carlos. Great drink menu (try their signature "Kiss the Fish")and to die for small plate menu. Must trys are the Ahi Tuna Poppers and the Angus Beef Slider. Tanq is also open for lunch and has some really great dishes, the Skirt Steak Salad is a favorite. Single Barrel, 43 W San Salvador St, ☎ +1 408 792-7356. Tu-Su 5PM-2AM. Speakeasy Style, without the passwords and gimmicks. Hyatt Place San Jose, 282 Almaden Blvd (at W San Carlos), ☎ +1 408 998-0400. Ultra-modern decor, event facilities, and a fitness center are available in downtown San Jose, near the west end of the Convention Center. Hotel De Anza, 233 W Santa Clara St (near San Pedro Square), ☎ +1 408 286-1000, toll-free: +1-800-843-3700. A restored historic hotel set in the midst of all the dining and entertainment of the downtown area near San Pedro Square. The Fairmont San Jose, 170 S Market St (near W San Fernando), ☎ +1 408 998-1900, toll-free: +1-800-527-4727. Two tall buildings connected by a skywalk over the Paseo de San Antonio. On the Plaza of Cesar Chavez and near the east end of the Convention Center, this large luxury hotel offers a day spa, fine dining in several restaurants, a fitness center and a rooftop pool. Four Points by Sheraton San Jose Downtown, 211 S 1st St (at pedestrian only Paseo de San Antonio), ☎ +1 408 282-8800. One of the more intimate Four Points in a classic 1911 building, with a lounge, outdoor patio, bocce ball courts, business and fitness centers. Near the east end of the Convention Center. 37.32919-121.89051 Hilton San Jose, 300 Almaden Blvd (at W San Carlos), ☎ +1 408 947-4450. Attached to the west end of the Convention Center, this non-smoking hotel is very convenient for convention attendees. It's on the Light Rail route. Pool and jacuzzi, high-speed internet and fitness room. Smaller pets allowed. Sainte Claire Hotel, 302 S Market St (at W San Carlos), ☎ +1 408 295-2000. Stately hotel in the heart of downtown San Jose, near the east end of the Convention Center. Member of the Historic Hotels of America. San Jose Marriott, 301 S Market St (at W San Carlos), ☎ +1 408 280-1300, toll-free: +1-800-314-0928. Attached to the east end of the Convention Center. The Marriott is a AAA Four-Diamond hotel in the heart of Downtown San Jose that offers facilities and technology for meetings and presentations, high-speed internet, a pool, a fitness center and a smoke-free environment. Clarion Hotel San Jose Airport, 1355 N 4th St (1 mile east of San Jose International Airport), toll-free: +1-888-453-5340. Check-in: 3PM, check-out: 11AM. Resort-style hotel with complimentary hot breakfast buffet, business and meeting amenities, specials and packages, plus proximity to museums, golf courses and theme parks. $87-107 per night. Dolce Hayes Mansion, 200 Edenvale Ave, toll-free: +1-866-981-3300. Check-in: 3PM, check-out: 11AM. $114-197 per night. 37.37185-121.92272 Doubletree by Hilton, 2050 Gateway Pl (Less than half a mile from the San Jose airport), ☎ +1 408 453-4000. Check-in: 3PM, check-out: noon. A popular location for meetings and conventions. Heated outdoor pool and spa, 24-hour fitness center, and plenty of dining options. 37.38452-121.928483 Homewood Suites by Hilton, 10 W Trimble Rd, ☎ +1 408 428-9900. Check-in: 3PM, check-out: 11AM. An all-suite hotel with fully-equipped kitchens. Complimentary hot breakfast daily, dinner with beer and wine M-Th, and high-speed Internet. Howard Johnson Express San Jose, 1215 S 1st St (a mile south of downtown), toll-free: +1-800-509-7666. Free high-speed and wireless internet, newspapers, breakfast, fax and copy services. Motel 6 San Jose South, 2560 Fontaine Rd, ☎ +1 408 270-3131, fax: +1 408 270-6235. Kids stay free, pets are allowed. Minutes away from the Santa Clara County Fairgrounds. Outdoor pool, Wi-Fi is available for a small fee. [dead link] Pruneyard Plaza Hotel, 1995 S Bascom Ave, Campbell, toll-free: +1-800-559-4344. A Tuscan-style retreat in downtown Campbell a few minutes drive from downtown San Jose. Smoke-free hotel with a pool and jacuzzi, fitness center and 24 hour business center. Free Wi-Fi, continental breakfast, newspaper delivery and parking. San Jose Airport Inn, 1440 N 1st St (near San Jose Airport), ☎ +1 408 53-7750. 24-hour service. Residence Inn San Jose South, 6111 San Ignacio Ave, ☎ +1 408 226-7676, fax: +1 408 226-9916. Smoke-free hotel has studios and spacious extended-stay suites. Outdoor pool, fitness center, free high-speed internet and breakfast. Sleep Inn Silicon Valley, 2390 Harris Way (3 miles from the airport), ☎ +1 408 434-9330. Free high-speed internet, a large desk workspace and ergonomic office chairs. Fitness center, free continental breakfast, microwaves and refrigerators in every room. Very close to the Paramount's Great America amusement park. TownePlace Suites San Jose Cupertino, 440 Saratoga Ave, ☎ +1 408 984-5903, fax: +1 408 984-5904. Very close to the Winchester Mystery House and the shopping and entertainment of Santana Row. Smoke-free hotel with outdoor pool, jacuzzi and barbecue area for its guests. Free wired and Wi-Fi internet access. Vagabond Inn San Jose, 1488 N 1st St (near San Jose Airport), ☎ +1 408 453-8822. Check-in: 3PM, check-out: 11AM. A discount hotel minutes from the airport. 24-hour Denny's restaurant on-site. Spa and heated pool, free continental breakfast and weekday newspaper. Pet-friendly rooms available. Business friendly rooms have work space, a larger TV with remote control, dual-line phones and a desk lamp with an additional outlet. Each room has free wifi, high speed Internet access, cable with ESPN, CNN and the Movie Channel. Courtyard San Jose Airport, 1727 Technology Dr, ☎ +1 408 441-6111. Mexico, 302 Enzo Drive, Suite 200, ☎ +1 408 294-3414, fax: +1 408 294-4506. Just east of the city lies Alum Rock Park, a canyon through which Penitencia Creek flows, which is lined by sulfurous mineral springs and several small waterfalls. Above the park stands Mount Hamilton, one of the highest peaks in the Bay Area at 4,213 feet. The telescopes of Lick Observatory, operated by the University of California, crown the summit and are open to the public during daytime hours. Northeast of San Jose is the Livermore Valley, which includes wine country and the cities of Pleasanton and Livermore. Other places to see in San Jose's backyard are the Scenic Drive in Saratoga Hills, the quaint and classy town of Los Gatos, and Mission Santa Clara at Santa Clara University. Palo Alto and Stanford University are about half an hour's drive to the north. About 45 minutes northeast, you can visit Fremont's Mission San Jose and the Ardenwood Historic Farm. Less than an hour away over the scenic Santa Cruz Mountains, the small coastal city of Santa Cruz is a nice day trip out San Jose. Spend the day enjoying the beaches and Boardwalk, or make it the first stop on a longer coastal drive. From Santa Cruz, you can take Route 1 (also known as the Pacific Coast Highway) south to Capitola, Monterey, and the charming town of Carmel-by-the-Sea. The Pacific Coast Highway is a nationally famous highway. It goes along the whole coast of California giving off spectacular views of the Pacific Ocean. Many movies have shown this highway in scenes that take place in California, and it is also a main tourist attraction to drive along the coast. Route 1 can take you up to Pacifica which is about 30 minutes north of San Jose. Pacifica is an ocean side residential town that has affordable housing and sit's on hills that overlook the Pacific. The beach here is typical to the Bay Area and has a very rough current. Less than an hour away is Half Moon Bay beach. This beach sits on the bottom of cliffs with a very rough current. During most the summer months the water is closed to swimmers because of rip tides and massive waves. The Pacific ocean is typically cold and in half moon bay this is still very true. The sunsets here have been known to lure in travelers and those wanting to rent beach houses. Since Half Moon Bay sits on cliffs, the sunset goes down over the water and seems to create perfect scenery. Only about an hour and fifteen minutes north, taking highway 101, is the city of San Francisco. San Francisco is the heart of the Bay Area and is the proud owner of the Golden Gate bridge. San Francisco has may neighborhoods with all kinds of restaurants, shopping, parks, beaches, and views of the bridge. The rolling hills of San Jose surround the city creating a valley. See the top of these hills by driving into East San Jose. The houses on the hills are spread out and ranch from ranches, farms, and even mansions. These houses can be seen from the valley and the picturesque drive leads to the top of the hills where you can see the entire landscape of San Jose. On the Fourth of July, many San Jose natives come up to the hills to watch the spectacular firework show over the city. This city travel guide to San Jose is a usable article. It has information on how to get there and on restaurants and hotels. An adventurous person could use this article, but please feel free to improve it by editing the page.